Wheelersburg’s Jaydren Guthrie chips in a putt on Tuesday morning at the Elks Country Club in McDermott. 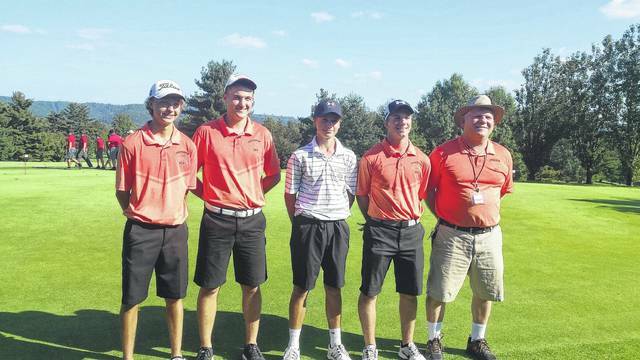 The 2017 Wheelersburg golf program stands together after qualifying for the Division II Southeast District Tournament, which will be held at Crown Hill Golf Course in Williamsport next week. Portsmouth’s William Sturgill stands after shooting the best round of his high school career (77) on Tuesday afternoon at the Elks Country Club in McDermott. Sturgill finished third in a Division II Southeast Sectional round, which consisted of schools from Scioto, Lawrence, and Gallia. MCDERMOTT — Sweating bullets is certainly not what one wants to do as far as life is concerned. However, when an accomplishment can officially be obtained, sweating those very bullets makes the hard work, in a sense, that much more enjoyable. On Tuesday afternoon, Paul Boll and the entire Wheelersburg Pirates’ golf program got to see the fruits of their labor at the Elks Country Club as Tanner Stevenson’s 97 — one of the last official scorecards to be turned in for the tournament — allowed the Pirates to claim the fifth and final advancing slot in a OHSAA Southeast District sectional. However, Wheelersburg certainly wasn’t alone in the excellent accomplishments. Portsmouth’s William Sturgill, who has put together excellent rounds all year long, collected a 77 to obtain the best 18-hole score of his career, and West, despite losing SSU standout Jordan Tieman, Buster Boggs, and Trenton Cole from last year’s district-appearing unit, managed to collect a top-10 finish with a promising group of youngsters in a OHSAA Division II Southeast District Sectional Golf Tournament in McDermott. For Sturgill, the score — which allowed the junior standout to finish in third place overall from an individual standpoint — comes off of the heels of the 88 that he shot last year at the Elks, which allowed the Trojans to qualify as a team. While Portsmouth didn’t have enough numbers to compete as a unit with Katy Pertuset competing in the Division II Girls Sectional Tournament in Chillicothe, Sturgill made sure that the Trojans would be represented for the second year in a row by overcoming a 42 on the back nine to shoot a 35 on the front half en route to clinching his berth with the aforementioned 77 — four strokes back of Co-Medalists Talon Osborne (Waverly) and Logan Reed (Rock Hill), who each shot a 73. While nobody else from Scioto County had the kind of day that Sturgill had individually, the Pirates certainly had one of their strongest performances to date as Wheelersburg used Trevin Mault’s 84, Jaydren Guthrie’s 92, Tanner Stevenson’s 97, and Carson McCorkle’s 99 to claim the fifth and final transfer position by two strokes over sixth-place Chesapeake (372-374) while also edging seventh-place Gallia Academy by five strokes for the final district-advancing slot. 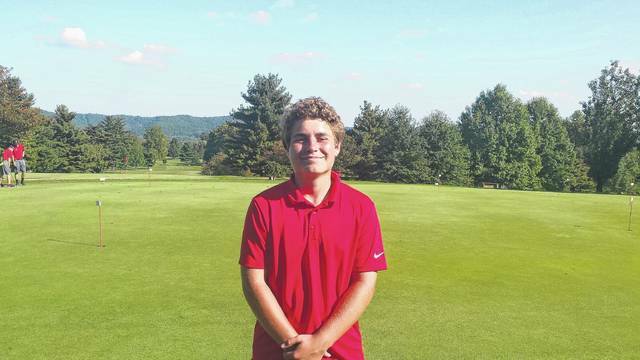 Mault’s and Guthrie’s consistency — 42s and 46s on each side of the course for the freshman and senior — and Stevenson’s back nine 45, which was an uptick from the 52 that the sophomore shot on the front nine, proved to be the differences in the Pirates advancing to Crown Hill Golf Course in Williamsport for district play. Boll and Sturgill, in particular, were complimentary of Mault’s game, which was showcased in spades on Tuesday. Mault’s 84 not only put the freshman in a tie for ninth place in the overall standings, but also proved to be the second best score for any freshman participant. Only Fairland’s Clayton Thomas, who tied with Piketon’s Creed Bentley for fourth place with an 80, fared better among freshman, with Conner Heffner, a Waverly sophomore who collected a sixth-place mark, joining Thomas as the only underclassmen to fare better than Mault. “Trevin plays a lot of golf, and that’s what it takes,” Boll said. As for West, the Senators, who shot a 363 last season as a team, collected an excellent score despite having to replace all but Brady Whitt in the main scoring column, as West took home a 382 to finish 10 strokes back of Wheelersburg in eighth place. Ethan Daniel’s 91, along with a pair of 95s from Whitt and Dustin Sowards, proved to be critical in the final outcome for the Senators on Tuesday. Eli Adkins (101) and Chase Howell (110) rounded out a solid showing from a unit that will return everybody but Daniel to its lineup in 2018. As expected, however, Gray believes that the Senators have work that will need to be done in the offseason. With the Division II Sectional Championships in the books, district play, which commences early next week, follows. 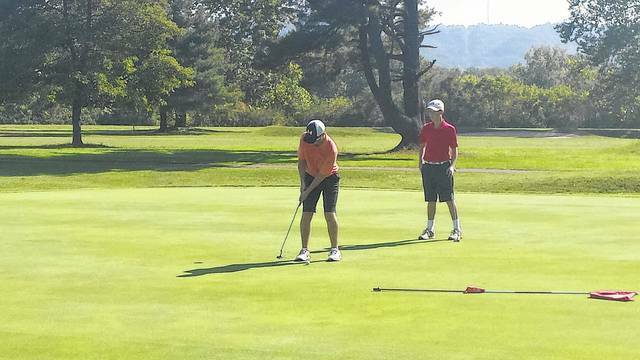 For Sturgill, and the entire Wheelersburg unit, Williamsport’s Crown Hill Golf Course awaits. Before that, however, there is work to be done. That work, however, is a relished quality — especially for Sturgill. In addition to the aforementioned competitors, Northwest’s Nick Golland and Minford’s Zac Hammond each shined on Tuesday, with Golland — who shot an 89 to finish in 19th — missing an opportunity to play in a three-hole playoff for the third, fourth, and fifth individual slots by just one stroke in regulation play. Hammond added a 94 en route to collecting a 28th-place finish. Overall, Piketon continued its reign over the Division II Southeast District Tournament field by collecting a one-stroke victory over Waverly (333-334) en route to a sectional championship. Bentley, along with Bradon Wooldridge (83), Colton Blakeman (84), Jamie Clifford (86), and Denzel Endicott (88) all finished with scores under 90 for the Redstreaks, while Osborne (73), Conner Heffner (81), Eric Heffner (86), and 94s from Cole Robertson and Grant Lybrook rounded out the Tigers’ total. In addition to the above pair, Fairland (343) and Rock Hill (362) finished third and fourth, respectively, as a team, while Ironton’s James Carter (87) and Brayden Easterling (88) qualified as individuals. Easterling, along with Chesapeake’s Austin Jackson and Gallia Academy’s Kaden Thomas, collected the final three individual slots in a three-hole playoff that also consisted of Endicott and the Dragons’ Mason Manns.